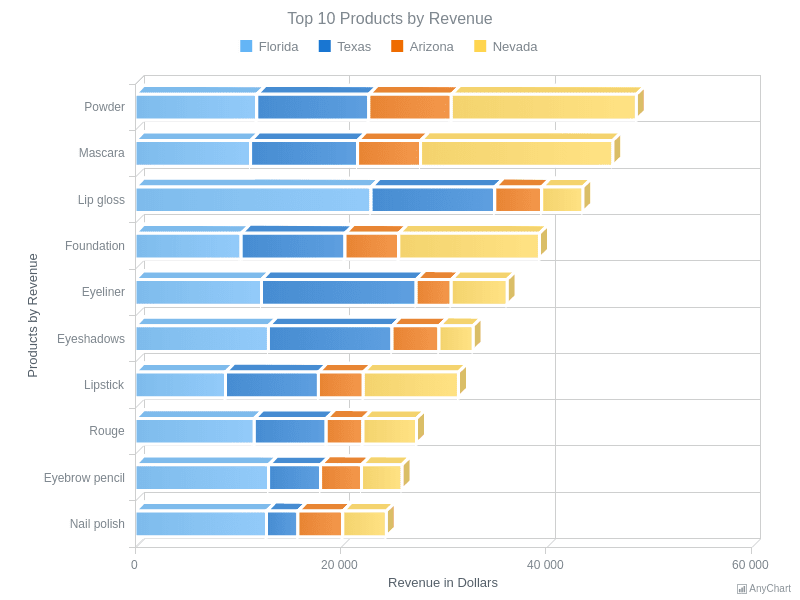 100 Stacked 3D Bar ChartA Chart of 4 series with 3 categories, each value for a category is a part of a whole and all values for each category are taken as 100%. This Chart also demonstrates the 3D visual setting. 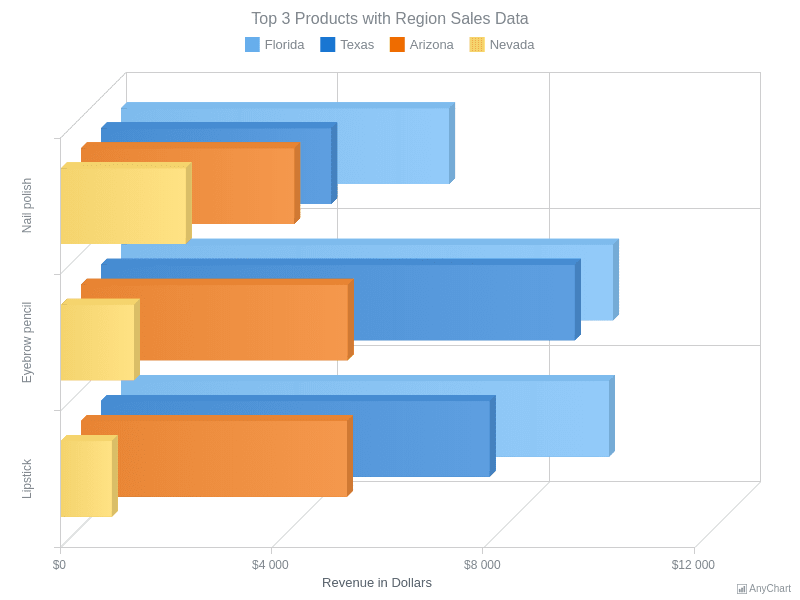 3D Bar ChartA Chart with one Bar series, demonstrating the 3D visual feature. 3D Bar Chart with HatchFillA Chart with one 3D Bar series filled with color and a hatch fill. 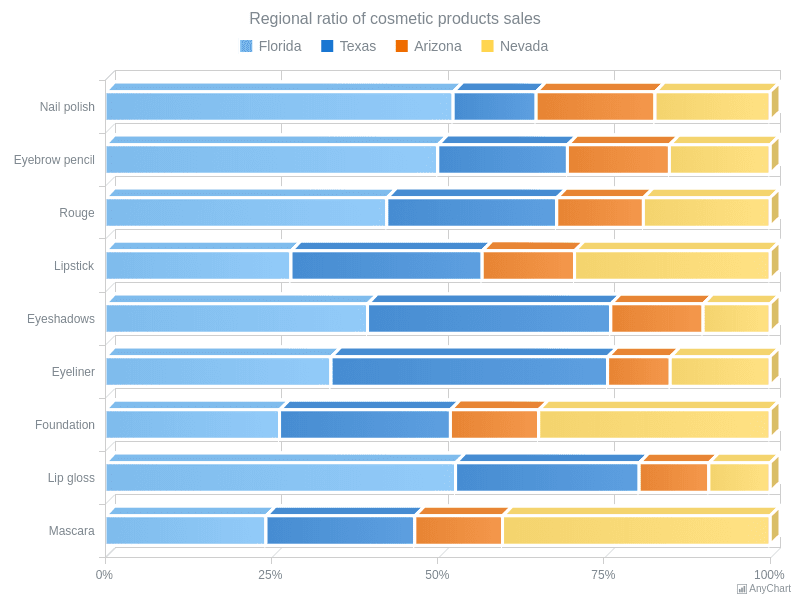 Multi-Series 3D Bar ChartA chart of four 3D Bar series showing the sales of 3 cosmetic products in Florida, Texas, Arizona and Nevada. 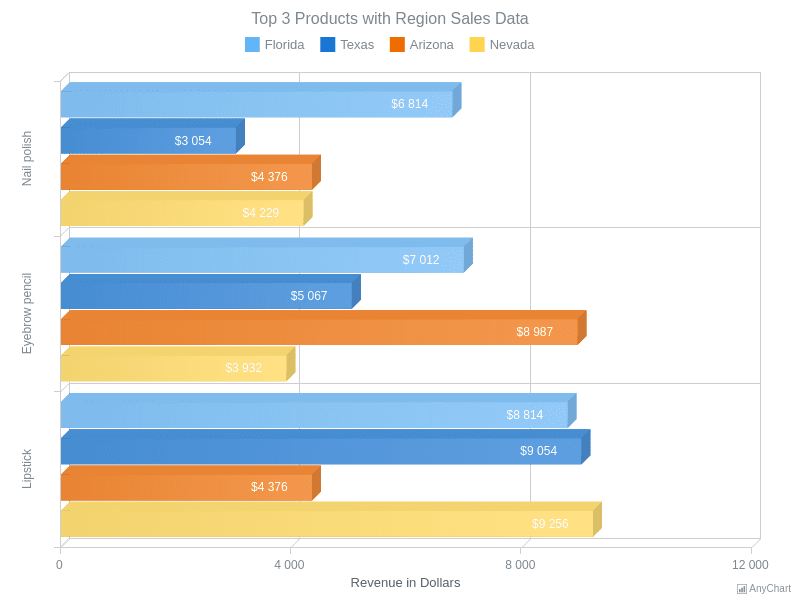 Multi-Series 3D Bar Chart with Z DistributionThis 3D Bar Chart displays top three cosmetic products sales in four regions. The series are redistributed along the Z-Axis instead of being placed along the X-Axis as usual. 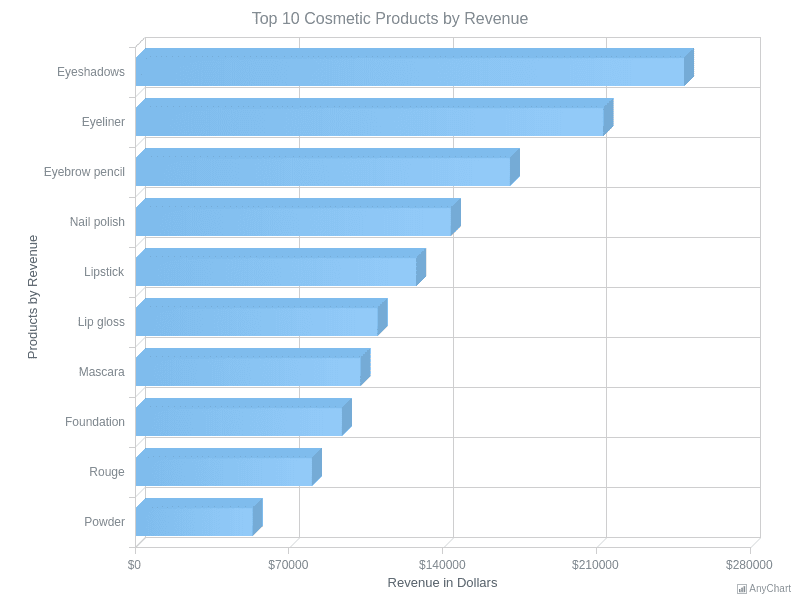 Stacked 3D Bar ChartThis chart shows the revenue amount gained from top 10 costemic products sold in four states. 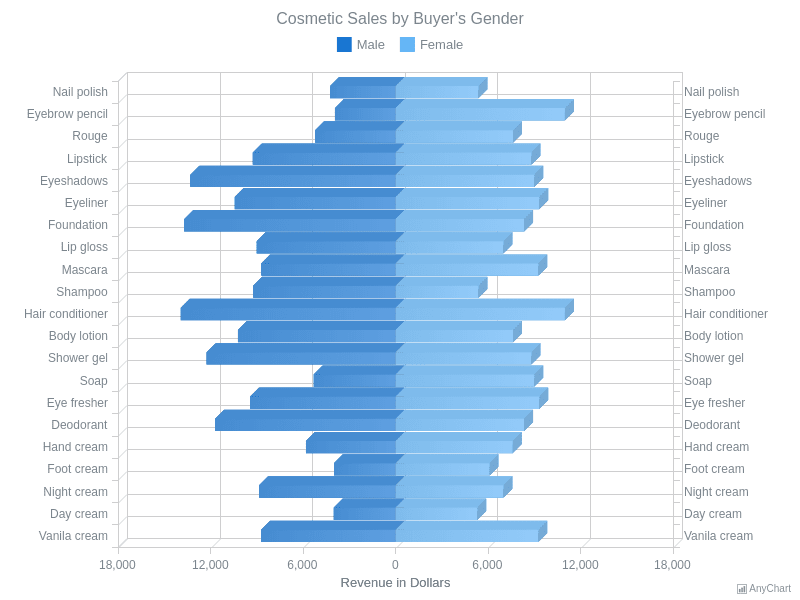 Stacked 3D Bar Chart with Negative ValuesA chart with two series demonstrating a profit from cosmetic products bought by men and women with the null point in the center of the chart and using negative values to show the profit from cosmetic products bought by men.